Black pepper, the oldest spice used by man, is a native of India . Present Kerala State to be precise . It started as wild vines in the forests. ﻿The oldest mention about pepper is in Indian epics written around 4th century BCE - for preservation of food and for traditional medicines ! But pepper became more popular else where than India if the export history of 4000 years is trailed. The Greeks were mad for it , followed by Romans . It was used by the Egyptian Pharaohs . Black peppercorns were found stuffed in the nostrils of Ramesses second , placed there as a part of mummification ! It was an expensive item that only the very rich could afford . 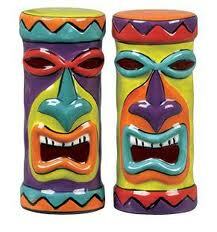 The Greeks and Romans accepted pepper in lieu of money for dowry, taxes and rents ! History says that in AD 408 , Alaric the Goth demanded 3000lbs of black pepper as a part of ransom for Rome , which was paid !! 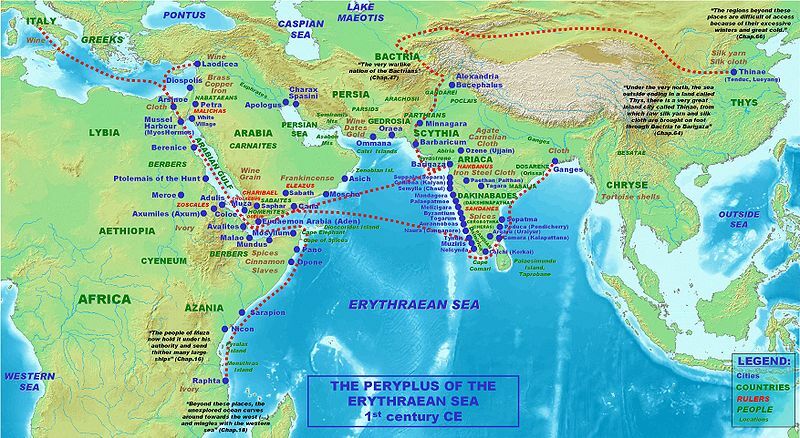 ﻿Muziris , the ancient port in Kerala , India is clearly identified in the map . Muziris which is no more existing is very close, just 40 kms away, to Kochi which has a modern port now including a massive container terminal of international standards. Interestingly Kochi market controls the price of pepper in India to this day ! . Greek navigator Hippalus found out about the peculiarity of monsoon winds in the 1st century .The changing winds of the monsoons blew southwest from April to October and northwest from October to April . This wind which is named after him made thousands of traders to take advantage of this knowledge .Thereafter their voyage shortened to less than a year . 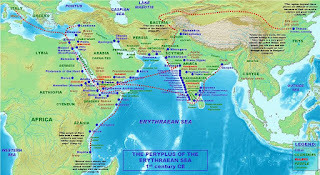 And it is this port Muziris , the route and the wind Hippalus which brought initially Judaism in 580 BCE , Christianity (St Thomas Syrian Christians) in AD 52 , and later Islam in 6th century AD to India , a fact unknown to most of the Europeans , Arabs or even good number of Indians I have met and interacted . Most of them thought it was Europeans who introduced Christianity and Judaism to India , while the Moguls brought Islam to India !! Christianity came to Kerala before it reached Rome and centuries before it reached Portugal , Britain or most of the European countires and merged to be a part of fabric of Indian (Kerala) society!! Thanks to the magnanimity of Hindu rulers and tolerant teachings of Hinduism , all coexisted peacefully in the society thereafter and a thriving and unique society emerged which is prevalent to this day . Today state of Kerala with a population with 50% Hindus, 24%Muslims,18% Christians and 8% others occupies a special position in India and rest of the world . An educated - 100% literate state in India- , cultured, integrated society where all speak the same language , think alike- good or bad- , having more or less common grounds in eating, dressing habits is a successful example of national integration of a country like India!!! After decline of the power of Greece and Rome , other European countries continued the trade and quest after pepper and other spices from Kerala , India. 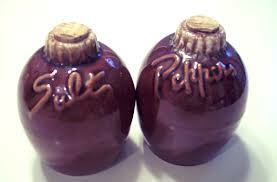 Pippali , the original Tamil(Indian) word was turned to 'piper' and to 'pepe' and finally to 'pepper' by them. Soon they faced a threat from the nomadic Arab merchants from middle east in control of trading in Indian Ocean as years went by. Arabs cleverly traded between India and the west and made fortunes as middlemen . To this day they are very good traders, I have experienced .Europeans wanted to do direct business but could not avoid the Arabs . As such they kept on trying for new routes than the existing , many navigators from Spain , Portugal , The Netherlands , Britain and others were encouraged by the rulers .Finally Vasco Da Gama of Portugal won the race in 1498 landing in Kerala , India . Once the East India company took control of the pepper trade , it made sure of the vast tonnage black pepper shipped to Europe from India , which reduced the price of black pepper drastically there. The British added a new word and usage in English vocabulary from pepper at least for the last 100 years . Now ' pep' means vigor !! 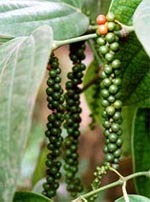 At present in Kerala cuisines and curries more than black pepper , the long pepper is used .Long pepper was introduced to Kerala from South America in the 14th century by non other than Vasco Da Gama , the Portuguese navigator who invented a new route in the world in quest of land of pepper . This could be an interesting irony ! !